It is the 4th of July and Janet and I are sitting in an airport in Tel Aviv Israel. We were just in Egypt two days ago and were so happy to get back through security into Israel heading back home to America. 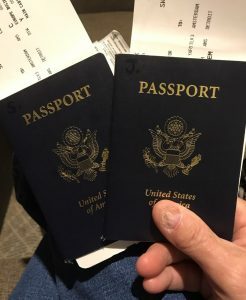 One of my most valued possessions enables us to travel through all these countries, but more than anything else, in allows me to enter back in to the most wonderful and free country that has ever existed–the United States of America. So what is this possession I am so proud of? It’s our United States passports declaring that we are citizens of this marvelous country. On this 4th of July Janet and I pray that God will bless America and our new president. I feel that God has given our country a reprieve and I hope we will use it wisely. The Left has no sense of humor or perspective. When leftists practice real violence (black hoods, beatings and all) there is no sense of outrage or condemnation. But when there’s a humorous tweet there’s all kinds of condemnation and outrage, huffing, puffing and sputtering. Most Americans know exactly what Trump’s tweet was saying. Only the myopic, humorless media and Left is clueless. CNN has been lying and defaming Trump, Christians, middle America, Conservatives and normal Americans like me for a long time. Trump is resisting them and hopefully taking them down. This was just a humorous parody on that. Lighten up LEFT! When leftists have real violence there is no condemnation but when there’s a humorous tweet there’s all kinds of condemnation and out rage. Frankly, one of the problems with the Left is they have no sense of humor or FairPlay whatsoever. In the run-up to the Iraq war, a Bush White House official explained to me that 9/11 had changed the way we read national security intelligence. There was a relaxed way to read intelligence, he said, and there was an alarmed way to read intelligence. September 11 proved that we had to read intelligence — say, on Iraqi weapons of mass destruction — in an alarmed way to avoid another disaster. Therefore, we had to invade Iraq. I thought of that conversation amid the reaction to President Trump’s latest tweet, showing him taking down CNN in a World Wrestling Entertainment video. There is a relaxed way to read the tweet, and there is an alarmed way to read the tweet. The media-politico complex is choosing the alarmed way, with a vengeance. The relaxed way to read the tweet is that the president is — among other things — an entertainer. He was an entertainer when he was a real estate developer, he was an entertainer when he was a reality show producer and star, and he is an entertainer as president. That doesn’t mean he is not other things — Trump Tower really was built, for example — but it means that he knows how to communicate in the style of an entertainer. That’s what he did in the WWE tweet. The alarmed way to read the tweet is that the president is inciting violence against journalists. That is the way that most journalists chose to see it. “The president of the United States is encouraging violence against journalists,” tweeted Atlantic editor Jeffrey Goldberg Sunday morning, reflecting what dozens of other establishment journalists were saying. CNN’s statement in reaction to the president, plus that of the Reporters Committee for Freedom of the Press, said much the same thing. It’s just an impression, but one could note that some journalists seemed more alarmed by the president’s tweets than by other recent examples of violent political expression — Kathy Griffin holding what appeared to be Trump’s bloody, severed head, or the Trump-as-Caesar assassination, for example. That is probably because many journalists are simply more worried about the prospect of right-wing violence than they are about the prospect of left-wing violence. The Southern Poverty Law Center, a favored source among some reporters, did not built up a nine-figure endowment by warning about violence from the Left. For those reasons — the fact that many journalists are more worried about the prospect of right-wing violence than left-wing violence, plus their belief that Trump is a threat to freedom of the press — many in the reporting and commentary world chose to read the president’s tweet in the most alarmed way possible. It was the strangest thing they had ever heard. It was not necessarily the singing¾they had heard that before. It was the time of the singing¾midnight¾and it was the place of the singing. This was no temple or amphitheater. The men were down below, where rats scurry over their faces in the darkness and the bugs scamper under their clothing and bite. It was damp and cold and foul. The wounds from the severe beatings were swollen and discolored. The shackles clamped on the ankles would usually incite cursing. They had heard screams and cursing from the jail before¾that was nothing new. But never had they heard joyous singing. But it was the earthquake that scared the jailer. The ground shook and prison doors flew open. He saw the open door and was ready to fall on his sword, afraid the prisoners had escaped. He knew the penalty for allowing prisoners to escape¾instant execution. From the depth of the prison he heard a voice calling: “Do not harm yourself, for we are all here.” The city was Philippi in Macedonia and the year was about ad 51. Paul and Silas had been imprisoned for preaching and for casting an evil spirit out of a young slave girl–a girl exploited by her masters for soothsaying and great profit. Having been spared by the two men rejoicing in chains¾and the power of God¾the trembling jailer fell to his knees before Paul and pleaded, “What must I do to be saved?” He was baptized that very night with his whole household. They soon joined Lydia and her household who had heard Paul’s message earlier and believed (Acts 16:14-15). The church in Philippi was born. It is now about ten years later, between ad 61-63 and Paul, again in chains, writes a joyful letter to the young church that he had established in Philippi. They had been the first to hear the gospel in Europe. Paul was writing from prison, in Rome, confined by chains and guards (Acts 28:16, 30-31). But again, he was joyful. In fact, in his short letter to the Philippians he uses the word “joy” or “rejoice” an unprecedented sixteen times. His heart could sing with joy even though his body groaned in pain. He was teaching by example—rejoice always; keep your eyes on Jesus. The early Church was full of singing; it was the verbal expression of the joy within. Singing was probably different than we know it today—probably a melodic chant led by a canter and repeated by the people. Christians did not invent hymns. They were sung by pagans to honor and laud their gods and heroes. In the Church hymns were sung as a natural expression of Christian joy, and, based in part on Jewish synagogue practice, an integral part of worship. Paul exhorted his friends in Philippi, “Rejoice in the Lord always; again I will say, Rejoice” (Phil 4:4). Not only were these ancient hymns sung as an expression of joy, but they were also used to instruct the faithful, providing a creed, so to speak, memorized as a song.